Epson Toyocom Corp. announced that it will release a new series of voltage-controlled X'tal (crystal) oscillators (VCXO) that support mobile handsets capable of receiving terrestrial digital TV broadcasts. The VG-4231CE Series will be among the smallest-footprint crystal solutions in the industry yet will offer frequency control characteristics equivalent to their predecessors. This will allow them to meet the ongoing demand for miniaturization while also easily handling the complicated timing of high-quality image recording signals. Samples will begin shipping in February 2006. Proxim Wireless Corporation, a global provider of broadband wireless equipment and subsidiary of Terabeam, Inc., today announced that it is supplying NEC Infrontia Corp., a leading manufacturer of key telephone systems and point-of-sale (POS) systems, with the infrastructure to deploy Wi-Fi hotspots and wireless POS solutions throughout Japan in all of the locations of two large retail chains. These deployments are individually the largest retail wireless networks in both companies' history. Users of Java-capable cell phones anywhere may find browsing the Web easier and cheaper now that Opera Software ASA is allowing anyone to download its Opera Mini application. The official worldwide launch of Opera Mini is planned for January but Opera has quietly lifted restrictions that previously allowed only residents of some Nordic countries and Germany to download the application, a spokesman has confirmed. "The idea is that you shouldn't have to buy an expensive smart phone to browse the full Web," said Eskil Sivertsen, a spokesman for Opera. Cellcom Israel Ltd. reports that it has 50,000 i-mode subscribers three months after launch. Since their i-mode roll-out in September, Cellcom has been adding content, which now includes 96 Israeli websites and access to 80,000 foreign websites. Cellcom said most new i-mode subscribers since the launch of the service use it extensively, although it should be kept in mind that most services are given free during the first months of use. Japan-based Hitachi Ltd. and Hitachi Mobile Co. have announced a stock-for-stock exchange that would make Hitachi Mobile a wholly-owned subsidiary of Hitachi. As part of its reorganization, Hitachi has positioned the automotive systems business as one of its targeted fields. In October 2004, Hitachi merged with Tokico Ltd and Hitachi Unisia Automotive Ltd. Hitachi now owns 64.8 percent of Hitachi Mobile. Shareholders of Hitachi Mobile are expected to vote on the merger in February. The Kanagawa Institute of Technology (KAIT) announced it would adopt a student ID card system utilizing contactless IC cards and mobile phones equipped with the equivalent functions. The IC cards and mobile phones can be used for automatic record of attendance, admission to buildings and issuance of various certificates. In addition, the system allows purchase of goods by using "Edy" electronic money. According to KAIT, it will be the first university in Japan to use mobile phones as student ID cards. As a first step, the university will provide 1,200 newly enrolled students with free mobile phones. Skype has just introduced two new, updated clients for the Windows Mobile 5.0 platform: Skype for Pocket PC Beta version 1.2 and Skype for Pocket PC low CPU Beta version. This latest release claims full support for low-CPU devices with 300+ MHz processors. 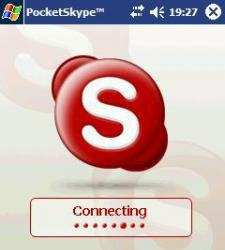 Users will be able to download and install the Internet telephony application with Danish, Dutch, Italian, Japanese, Korean, Norwegian, Portuguese Brazil, Russian, Spanish, and Swedish language plug-ins and it also supports the new call-forwarding feature and landscape mode for 240x240 and 480x480 screens. NTT and Sega Ltd. have started a joint experiment that utilizes object recognition technology developed by NTT Laboratory; the technology gives hyperlink functionality to patterns (trademarks, signboards, posters, etc.) as well as to solid things (commodities, etc.) that exist in the real world, and enables combination with various services on the Internet. The technology utilized in this experiment was developed by the NTT Cyber Communications Laboratory. NTT will conduct a verification of business applications through this joint experiment, while Sega will examine the development of new contents that use the technology. Seoul, Korea-based Samsung plans to sell phones to Vodafone K.K. by summer 2006, entering Japan's $3.9 bn handset market for the first time, according to company officials involved with the talks. Sophia Kim, a Samsung spokeswoman, and Vodafone's Tokyo-based spokesman Matthew Nicholson declined to comment. Vodafone Group already buys Samsung phones for markets outside of Japan. Interesting! We were just talking about this the other day! -- Eds.